We know all it takes is a spark to make the first connection. From meeting energy needs to discovering ways to protect our environment, a career at National Grid means more than a job. It means joining a group of talented people ready to embrace the potential of tomorrow. When you join us, you’ll work in a field undergoing massive change, and because of that you’ll have the opportunity to take your career in many directions depending on your skills and ambitions. And we’ll be right there with you. Our programs for students and graduates make sure you’ll have all the support you need to take your first steps – and reach goals beyond. Discover how National Grid connects your ambition with opportunity. As a National Grid intern, you’ll gain unique exposure to a wide range of technical and operational opportunities. And get a unique, firsthand look into our world-class company and our industry. You’ll also create a strong network that can help in a future career with us. These positions may be located in New England (Massachusetts & Rhode Island), Downstate New York (Long Island & Brooklyn) or Upstate New York (Syracuse, Albany & Buffalo). As an intern, you can take advantage of a wide range of technical and operational opportunities. You will acquire critical insight into our company and our industry, and develop valuable networking connections, which will help prepare you for future career opportunities. Once selected for an internship, you will participate in a broad range of meaningful work experiences that are related to your interest and field of study. Interns will have the opportunity to attend an interactive orientation within the first weeks of hire and participate in networking sessions and lunch & learns with company executives and other interns, as well as volunteer in a community-based event. Responsibilities will vary based upon your course of study and your assigned business. The successful candidate must be pursuing a college degree and possess excellent problem solving, organizational, and analytical skills, as well as proficiency in Microsoft Excel and Microsoft Word. If you are looking for an exciting opportunity to gain real work experience then we invite you to apply for one of our summer internships! If you possess the outlined job qualifications and have the desire to work in a highly collaborative environment that places great emphasis on team work, customer focus and results, we invite you to visit our career site to submit your resume. Please note the Summer Internship Program is seasonal. Our recruiting efforts begin in mid-September of each year and are usually available until early winter. This is subject to change, given the number of vacancies and applicants. If you wish to be considered for different regions, please apply to each posting. If your desired position is not posted, please come back and check the following year. National Grid also offers internships throughout the year. To find opportunities click search jobs. National Grid partners with community colleges across our Upstate New York and New England service area to offer students a unique opportunity to participate in certificate programs that prepare them to work in the energy industry. Courses vary in number of weeks, credits offered, and disciplines (with classes ranging from electric overhead line work to electricity generation to gas utility work and more, depending on the college). But all share a common goal: to help students gain the skills they need to work at an energy utility, and for energy utilities to fill their critical need for qualified entry-level workers. And they all offer students a unique opportunity to gain a broad range of knowledge and experience about the energy business, the science, and the work through a blend of classroom and hands-on laboratory projects. National Grid’s Graduate Development Program (GDP) is the company’s flagship pipeline program, targeting recent college graduates joining the company in entry-level full time positions. The GDP is designed to prepare early career professionals for future leadership roles within the organization, aims to support Graduates in developing as leaders, guide their career, and increase their business talents and skills. It provides opportunities for Graduates to explore a broad range of disciplines across our functions and locations, work on a variety of projects, and expand their network. 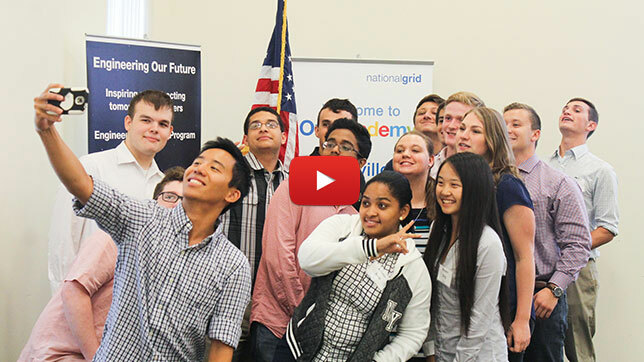 Graduates start their careers at National Grid with an 8-week Orientation. Graduates will spend time learning the core functions of the business, networking with our Executive team, and traveling to our different jurisdictional areas. By the end of Orientation, Graduates have an in depth understanding of who National Grid is as a company and how we do business. They will have formed a network with their fellow Graduates as well as senior business leaders, key GDP stakeholders and GDP Alumni. Following Orientation, Graduates begin working in their hired position. While specific positions vary year to year, past hiring departments have included: Gas Process & Engineering, Electric Process & Engineering, Procurement, Accounting & Finance, Information Services, Regulation & Pricing, Audit, Fleet Services, Performance Excellence, Customer, Human Resources and Operations. Graduates also take part in quarterly development sessions with their cohort as well as complete a Capstone Project at the end of their first year with the company. College leadership position (e.g., student government, clubs, athletics). Please note the Graduate Development Program is seasonal. Our recruiting efforts begin in mid-September of each year and positions are posted from September through November. This is subject to change, given the number of vacancies and applicants. National Grid offers an intense Leadership Development Program for top MBA graduates. The 18-24 month program is designed to expose Leadership Development Program (LDP) participants to the broad range of activities across our functions and jurisdictions, work on a variety of projects, and expand their business network. These are full time positions that begin in September with a 4-week intensive Orientation that acts as an introduction to the company. LDP participants will spend time learning the core functions of the business, networking with our Executive team, and traveling to our different jurisdictional areas (MA, RI, NY). At the end of the Orientation, participants will have an in depth understanding of who National Grid is as a company and how we do business. Program participants will then undertake three 6-8 month project based rotations that expose them to the full scope of the organization. Continued development opportunities occur throughout the rotations, including networking events, development workshops, volunteer opportunities, and a robust performance management process. After completion of the program, LDP participants will move into a direct management, program management, or strategy development role based on their interests and the organization’s needs. Depending on interests, these positions may be located in New England (Massachusetts & Rhode Island), Downstate New York (Long Island & Brooklyn) or Upstate New York (Syracuse, Albany & Buffalo). Please note the Leadership Development Program is seasonal and the rotation options vary year to year depending on business needs. Specific available rotations will included in the LDP job description once posted. Our recruiting efforts begin September of each year and positions are posted from September through early November. This is subject to change, given the number of vacancies and applicants.